For $3,900, Nothing But Pirate! Are you ready kids? Aye-aye, Captain! I can’t hear you! AYE-AYE CAPTAIN! 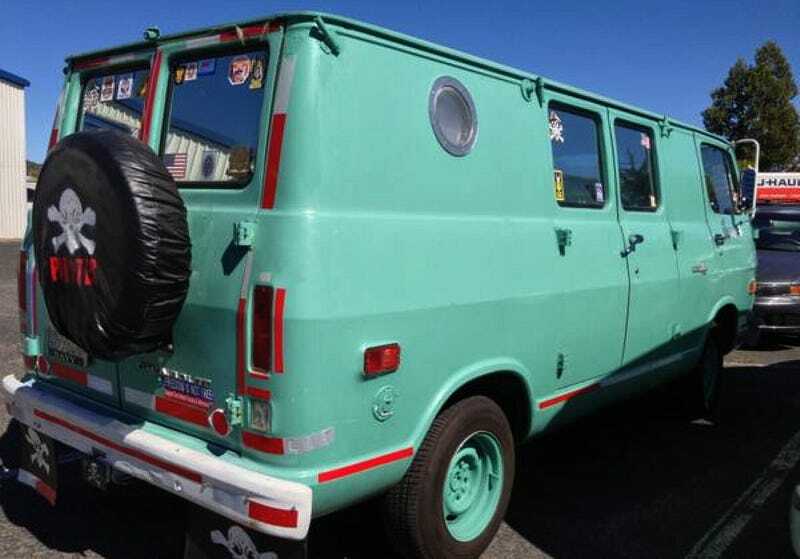 Oohhh, who has a turquoise-painted pirate themed van? Nice Price or Crack Pipe! But will its price fit in your plans? Nice Price or Crack Pipe! Nice Price-Crack Pipe, Nice Price-Crack Pipe, Nice Price. . . Crack Pipe! An interesting pairing, the British and the Japanese. They used to say that the sun never sets on the British Empire, and of course Japan’s flag features a rising sun, so there’s that. There was also the Rover/Honda partnership in the ‘80s which showed how the two nations - or at least their auto makers - could collaborate. The U.S. hates to be left out of other nation’s business, so of course yesterday we got to weigh in on that partnership, in the form of a tidy - and Stateside - 1993 Rover 216 SR. That of course is a British-born Civic with all the plusses and minuses which that entails. One plus that can now be added to its multi-national bona fides is a Nice Price win, because that’s just what an RCH-narrow 51% of you voted it. Back in 1973, balladeer Sammy Johns had a hit with the song Chevy Van which was about a dude getting busy with a hitchhiking hippie girl who, post ugly-bumping, does the right thing in Johns’ mind- making like a banana and splitting. Man, what a groovy scene. You are unlikely to get lucky - even if you stay up all night - in today’s 1967 Chevy Van. That’s because its pirate theme is not likely to stir any libidinous thoughts in any but the most eff-d up of Jack Sparrow fetishists. Chevrolet’s first entrant into the ‘60s minivan wars was the Corvair Greenbrier, which were amazing back then and are still today. Not too amazing apparently because the Greenbrier didn’t make the cut in the Corvair’s mid-sixties refresh. Instead, Chevy introduced the G-series compact vans which were based on the conventional Chevy II platform and fell more in line with the Ford Econoline and Dodge A100 competition. 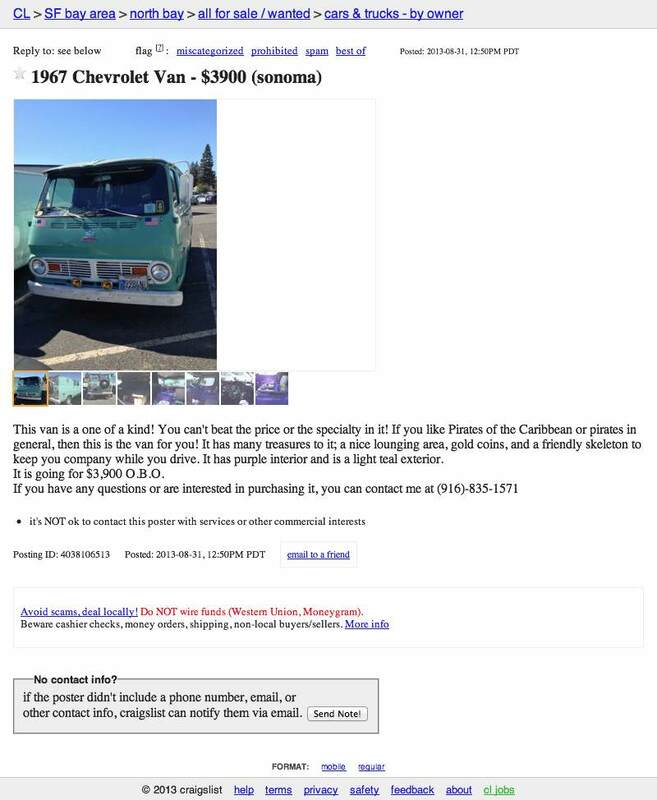 This 1967 Chevy Van is only a semi-creeper van as it sits half-way between people carrier and commercial van owing to the windows in its doors and none in the rest of the back panels. Chevy debuted a redesign for the G-Van in 1967, and that featured an enlarged doghouse that allowed room and cooling capacity for the company’s small V8 engine. Most however were powered by one version or another of the company’s stout but unremarkable OHV straight six. The ad doesn’t say what engine resides between this one’s seats, and that’s because its far too focused on the pirate theme that has been applied. Why a pirate theme you might ask? Arr, why not? The exterior is described as teal - a non-obvious pirate hue - but in fact looks a lot more like turquoise to me, at least in the pictures. Regardless, it looks like this long wheelbase (108-inch) van seems in decent shape on the outside. On the inside the purple paint and salty dog den of debauchery accouterments make it look like a perfect place to get your yo-ho-ho on. Of course, if you do car pool duty for a bunch of fourth graders, rolling up in this doubloony bin will make you an instant hero. Heroism doesn’t come cheap however - well, maybe it does as this van is only $3,900 according to the ad. What do you think about this pirate ship van for that kind of booty? Does that price shiver your timbers? Or, does it walk the plank? H/T to consistently inconsistent for the hookup!